Thanks again to Kiirstin for letting me post occasional reviews here. I enjoyed writing the last review very much, but I have struggled with the follow-up. I picked up this book largely at random while strolling through the library. I read an article about Flannery O'Connor in The Atlantic maybe 4 months earlier and I had thought at the time I should read something by her. The book opens with Mason Tarwater ("the Old Man"), bootlegger and prophet, dead at his kitchen table at Powderhead, a backwater farm. His great-nephew, Francis Mario Tarwater ("Tarwater") a teenaged boy kidnapped as a child by the Old Man, struggles with how to dispose of the body. We flash back through their dozen or so years together, the Old Man paranoid and controlling; Tarwater independent and willful, but with a reality born from the Old Man. In flashback we encounter Rayber, Tarwater's uncle, and Rayber's "simple" son, Bishop. Like Tarwater, Rayber was abducted by the Old Man and taken to Powderhead as a child, but was rescued by his father. Rayber attempts to rescue Tarwater as a child, but is shot by the old man, and left half-deaf. The novel continues with Tarwater travelling to meet Rayber and Bishop, and in their encounters either escape the destiny laid out for him by the Old Man or fulfill it. Through a series of tragedies, the family consists only of these four characters. The set-up here is self-consciously neat. Closed and archetypal, the characters felt like they were arranged in two dimensions to rest neatly in quadrants, each aligned strongly on an axis. Damned if I can figure out exactly what those axes are. With the strong focus on religious themes and a small cast of archetypes, I read this as a parable. The slightly surreal environment that feels like it has thick air and a heavy echo fit with this reading beautifully. Nothing really had a sense of scale, and the sense of place and time was very loose. A parable, or stretching a bit, a fable: all the characters here have a slightly anthropomorphic feel. A number of reviews say the work contrasts the passion of the Old Man with the secular Rayber. I use the term 'passion' because I struggle with the lexicon of belief, but I mean a religious passion: both torment and engagement. But calling Rayber secular I think is dishonest. Rayber is all about suppression; his secularism is a willful reaction. He too was "infected" by the Old Man's passion, either by his genetics or during his abduction. Rayber himself feels it was awakened by the abduction, but the actual origin escapes him. There is a clarity to the Old Man's belief that borders on childishness. Rayber and Tarwater aren't lucky enough to inherit his clarity. For Rayber, the right and the sane are at odds. For Tarwater, destiny is a hopeless chain. Tarwater inherits the destiny from the Old Man: He must baptize Bishop. A pointless act, in Tarwater's mind; Bishop is simple, almost vacant. For this to be Tarwater's destiny seems an insult to the strong willed boy, but the compulsion is seated deep. Bishop and the Old Man reside in a world of simplicity and a sort of dark innocence. Actions flow from inevitability, both exist like twigs in a stream they don't bother to understand. Where Bishop is passive and reactive, the Old Man rages violently at virtually everything. Rayber and Tarwater live in a reality of conflict and uncertainty, for both of them, the devil is more internalized. This last point is the one that made this novel so interesting to me. Here is a honest representation of faith as torment. Tarwater's internal monologue is presented as a stranger who speaks to him. His monologue is temptation, distraction and resentment. I imagine this sort of monologue is familiar to most, but in this theology, it is the voice of the devil. In this theology, the devil is always present in us, challenging us away from the right path with confusion, while truth and God are permanently inaccessible. God might speak to us once in lifetime, but more likely our life is defined by resisting the chatter of the devil. But the "secular" Rayber is not really any different. I can't tell if his secularism is intentionally ironic, or if this is really how O'Connor imagines the secular mind. For someone of great belief like O'Connor, you can imagine that the secular mind is one that has to constantly battle off faith. She depicts Rayber as a man afraid of letting down his guard, lest he be infected with the dominating faith of the Old Man. But this guard insulates him from love and humanity as much as it does from faith. I think it is a narrow view of the secular, of course, this is the secularism of rejection, a negative only. I knew in advance of reading that Flannery O'Connor was a devout Catholic. A number of times through this work, I stopped and asked myself if I would be interpreting the material differently if I hadn't known she was a devout Catholic. This book is not marketing material for Christianity, the faithful here are tormented and ugly. I found one or two reviewers that said they read it as a cautionary tale about fundamentalism, I don't see how anyone could support that claim. While the images of religion can be stark at times, the pains of the faith are clearly something the author feels must be borne. The cautionary note here is about trying to suppress something seeded strongly inside you. Rayber has avoided the fundamentalist zeal, but he pays the highest price for his success. At the end, I asked myself if my knowledge about her beliefs caused me to interpret differently, I came to the conclusion that it would not. There is a lucid honesty to this that paints her theology in all its Catholic torment. O'Connor said her work was representative of Christian Realism. I liked this book, mostly because it presented a sort of faith that I can understand. It comes back around to passion, in it's old meaning of suffering. Her faith is one of great violence, not one of a warm grandfather. Reality is full of violence, as is the Bible. Is violence in conflict with God, or a core component of God? I think it is a type of theology that is deeply unpopular in mainstream North America right now. When I say that I can understand this sort of religiousness, I don't mean that I like it. I mean that the torment and the absence of God in this sort of religion at least aligns with the reality we see around us. No troubling ellipses here. 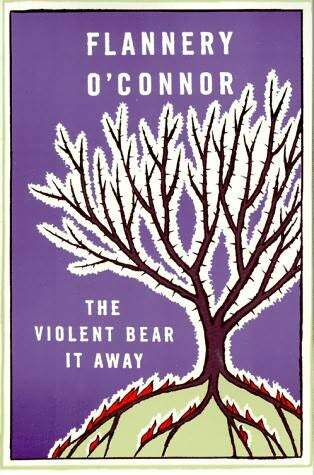 Growing up in the American South, it never occurred to me to read O'Connor as a Roman Catholic. In this one and Wise Blood, her character are deformed and twisted by misplaced faith, which doesn't seem exotic in a place where you can pass five different non-denominational variations on southern baptist churches in as many miles. There is a scene in this book which I am pretty sure is a representation of a Southern protestant church, likely a satire of a style of religion I am totally unfamiliar. I am highly removed from the culture here, so some of this was lost on me. I'm not sure she understood the protestant mind any more than she understood the secular mind, but it is hard for me to say from this position. I haven't read anything else by her. Do you recommend Wise Blood? I was thinking about looking at some of the short stories at some point. Wise Blood is very much like this one--disturbing. The short stories are better, I think.